I just wanted to pop in and say something right quick: I appreciate all the hard work that goes into doing your family trees because I have a few on Ancestry.com. HOWEVER, I also know that there are people who have family trees with tens of thousands of people on them – you have to know, due to the “odds” and human nature being what it is, many of those trees are just plain wrong. It’s called an NPE, or “not the paternity expected”. Like, your grandparents and ancestors cheated. Yep, they did. The baby mama or daddy is not who you have in your tree. This is why I resorted to having three generations of my family tested to get the truth. And even being tested, you can only go so far back, maybe about 10 generations…? Maybe more if you have some hearty DNA, so you could get lucky and get some strong-surviving autosomal DNA that gets your back further. And yes, for their Ancestry trees, sometimes people just copy and copy and copy the wrong data – over and over and over again – so there’s that part of the Ancestry database. I’m not being paid to advertise; I don’t do that. I do not recommend DNA testing on Ancestry.com, I’ve seen too many creepy stories about cops showing up at your door. The company 23andMe was started by the wife of one of the Google founders, so that creeps me out in a Big Brother way. I only recommend FamilyTreeDNA.com. The second season of TLC’s genealogy docu-series “Who Do You Think You Are?” will feature six new journeys with Valerie Bertinelli, Jesse Tyler Ferguson, Lauren Graham, Kelsey Grammer, Cynthia Nixon, Rachel McAdams and her sister, Kayleen McAdams. 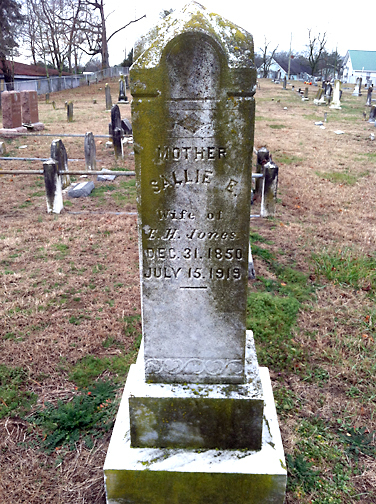 I am an amateur genealogist, hobby historian, and “graver” on FindAGrave – I enjoy locating and cleaning my ancestors’ headstones. My son considers it a morbid hobby, but I’m a firm believer in documenting family history, as much is physically lost, not recorded, misremembered, and literally forgotten over time. In our modern times, we have the ability and obligation (IMHO) to document our ancestry for our descendants who may have never known, or seen photos of, our grandparents, et al. My writing of this long article is to encourage you to make your family history count, and to help you preserve precious memories using the best headstone cleaner on the market. Here is my account and recommendation of a headstone cleaning product that I swear by – D/2 Biological Cleaning Solution. 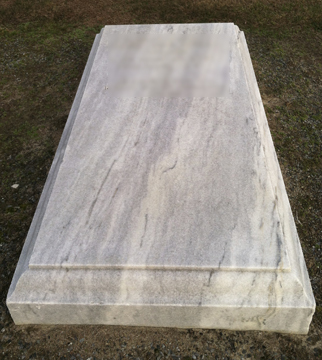 The product itself has diverse cleaning applications, but I’ll specifically cover headstone cleaning. According to the D/2 website, “D/2 Biological Solution is specially formulated to remove environmental pollution, dirt, and staining from biological soils such as mold, mildew, lichen, and algae from indoor and outdoor structures. Staining and soiling caused by mold, mildew, algae, lichens and air pollutants contribute significantly to the degradation and disfiguring of many types of construction surfaces. D/2 can be utilized to safely resolve this problem on all wood, stone, masonry, metal, vinyl, and roofing surfaces”. Of great importance and credibility, D/2 has been used on the White House, Arlington Cemetery, The Alamo, the Acropolis of Athens Greece, Tomb of the Unknown Soldier…the list is long. D/2 was developed by conservationists who saw how other cleaners with acids and salt caused stone to deteriorate; they solved the problem entirely. Tampico Bristle Brush, long-handled (ACE HARDWARE) – a great find for $7.49. The tampico “plant” is really the agave from whence we derive tequila! Bonus! The bristles are soft enough to use on your body, but stiff enough to clean newer headstones. I wouldn’t use this on older, deteriorating headstones, but it’s great to scrub lichens off, and practical enough to use to reach into engraved lettering to get the bio-material out. The long handle gives you leverage in case you need to really scrub some stuck-on mosses and great for larger, horizontal slab markers. My rule of thumb for which brush to use: if you wouldn’t use it on your body, don’t use it on a gravestone! 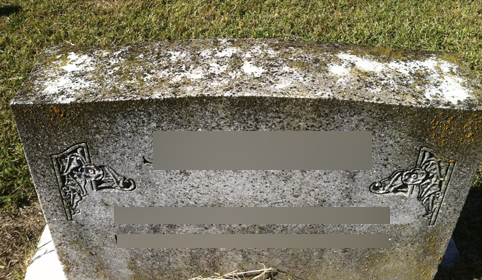 Honestly, I don’t even recommend plastic brushes of any kind – I’ve worked for a plastics company and I don’t think people realize how much plastic can rub or flake off into the headstones you’re cleaning, plus, they can make micro-scratches. Gallons of tap water or distilled water – Sure, we’d all love to use only distilled water to clean our graves, but if you fill some plastic jugs with tap water, air them out by allowing their lids off for 24+ hours so the chlorine or additives dissipate into the air, then use them for grave cleaning. One gallon equals 8 pounds. 1 Gallon or 48 oz. Hand-held Pressure Sprayer (ACE HARDWARE) – use this for your D/2 + water mixture. You can adjust the mist to fine or coarse. You don’t have to connect to a hose. Very handy and you can always use less than a gallon if it’s too heavy for you to carry around. One gallon equals 8 pounds. I applied D/2 Biological Solution to several of my ancestors’ headstones, many of which were covered with pollution, dirt, moss, lichens, molds, mildews, and plant materials. I was fortunate enough to have applied D/2 during a very dry spell in September 2013, allowing more than 10 days for the solution to work on the grime that covered the monuments. The headstones were granite, marble and sandstone; the oldest one installed in 1837. OPTION 1 = D/2 SOLUTION HANDS-FREE METHOD – What I’ve learned along the way…the first few stones I cleaned, I used D/2 only in a “hands-free” method – no pre-wetting of the stone and no scrubbing with brush+water. I used D/2 full strength. When I had returned weeks later, I found some stones much cleaner, but some not – apparently, some bio-growth held onto some stones. Bio-growth or bio-material are fancy terms for live, organic materials like moss or lichen. The D/2 had not failed; I just had some very heavy dirt on some stones (black soot? ), which had me try a physical cleaning in addition to the solution (OPTION 2). The hands-free “Option 1” may not work if lichens are still present. I think the biggest dirt culprit is lichens and their stubbornness to hold onto the stone. Literally. Lichens digest stone, and yes, they are live biological growths that need to be removed so they don’t eat away at the stone. Many lichens have lived for hundreds and thousands of years, so yes, please remove! Side note – D/2 will kill off lichen, but slowly, and they will turn yellow or brown when this happens. You still have to physically scrub them off, if the condition of your stone allows (more on this, keep reading!). NOTE – I did not have to scrub any of these headstones, I just chose to because I wanted to see what would happen, and the lichens bothered me. I could easily have left the stones alone so that in time, D/2 would do the work for me (OPTION 1). My personal physical intervention was my own trial. I’ve used plenty of D/2, so it wasn’t that it wasn’t working, I just got impatient! WHY D/2 WORKS WITHOUT HUMAN INTERVENTION – On the stones that I’d already treated with solution only, there was residual D/2 – as it should be. To prove this on a stone where you’ve already applied D/2, come back and ‘reactivate’ the solution by spraying water only on it – you’ll notice that the D/2 solution is still there, and a bit soapy looking (bubbles form on the surface) because D/2 contains a “surfactant” which causes the solution to bind to the headstone/monument. This is what you want! For this reason, I didn’t have to use more D/2 – I merely rewetted the residual D/2 with water to ‘reactivate’ it, and used my tampico brush to scrub off some stubborn bio-material. I think the bio-material had been on the stones for decades if not a century, but reactivating the D/2 with water and scrubbing a little definitely made the stones cleaner. No, I didn’t get the stones as clean as they could be, but I removed the worst grime, so that months from now, the D/2 can continue to reactivate with every rain and snow event, restoring the stones back to their original color. It’s incredible to see the original color of some stones – once you remove the dirt, the colors can be bright and gorgeous, revealing details not seen in decades or centuries! OPTION 2 = PRECLEANING WITH WATER + SCRUB BRUSH -> THEN USE D/2 – I’ve learned that if bio-material has been clinging for years, I could chose to physically remove it before using D/2. Why use more D/2 when I could use some water, a tampico brush and a little elbow grease to cut through the worst dirt? Granted, you shouldn’t use physical scrubbing for stones over 100 years of age, but that is my opinion only – please go to a professional monument company if you need to. I’m just saying, I’ve seen gorgeous slate headstones be in near-perfect condition after 150+ years, and some marble headstones granulate and deteriorate after 100 years – all depends on their method of creation, carving, engraving, installing, specific microclimates of the cemetery…in other words, it takes a keen eye, education, circumspect manner of assessment, and applied wisdom in order to get the exact cleaning method right for your particular situation. Of course, you can always use a combination of options 1 and 2 – you may have to do your own trial. Your individual results will vary – climates and micro-climates can make a huge difference on several factors like length of time to clean, temperatures, local molds and bio-materials, amount of rain, etc. 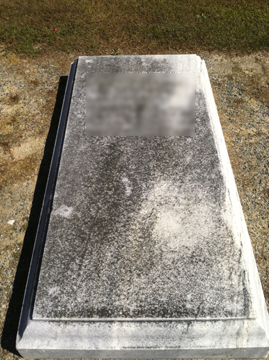 -Take a photo of the dry, untouched, ‘dirty’ headstone – this will serve as your “BEFORE” photo. -Use the tampico brush to lift up the hardest of bio-materials, scrubbing lightly in a circular motion (don’t use a brush if you have a granular stone! skip this step if you need to!). -Rinse with more water – not much water is really needed, just enough to rinse away the debris you’re removing. -Take another photo of the results from your manual scrubbing (this will serve as your “DURING” photo). You may actually be able to remove a lot of dirt just by scrubbing, which will save you some D/2 solution. -With a fine mister, spray on your diluted 1:1 D/2 Biological Solution + distilled water. The stone is already wet from rinsing, but the solution mixture will adhere to the stone even better. I think the solution penetrates the stone’s pores best this way. 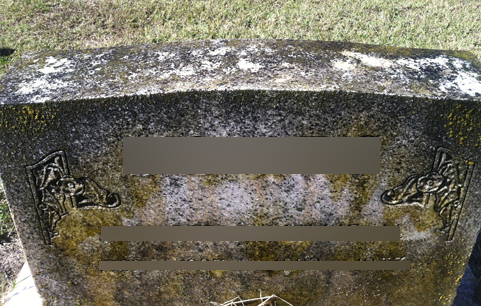 -Wait about 3-5 minutes, take another photo of the headstone – you may find the bio-materials on the stone turn it pink, red, orange, yellow, green – the possibilities are endless because the biological growth could be anything, and applying any biocide is likely to cause strange coloring with “die off”. This coloring is temporary, and will fade with time. It’s not stained, don’t panic! -Not necessary, but if you’d like, rinse off the D/2 after several minutes. I never rinsed off the D/2, and I didn’t mind the temporary colors. They’ll be rinsed off in the next rain shower anyway. -Wait – the cleaning affect could take days, weeks or months. -Come back and take a photo; maybe a volunteer from FindAGrave.com would be willing to take a photo for you, weeks later, in your absence. This photos will serve as your “AFTER” photo. If you have physical access to your headstone, come back in 1 week, 2 weeks, 1 month, 3 months, 6 months, 1 year, etc. to check the progress of your D/2 application. Take photos every time. See what areas are clean and which areas have stubborn growth. If you want to do some more scrubbing (again, condition is key! ), wet the stone to reactivate the D/2 and use your brush lightly. You can also choose to do nothing. Just remember to take photos every time to demonstrate the progress. You may find that after the initial D/2 treatment, you find physical deterioration, chipping, cracking, flaking, vandalism damage, landscaper damage, inferior repairs – it’s important that you take photos of things like this. The more you can document about the condition, the better. 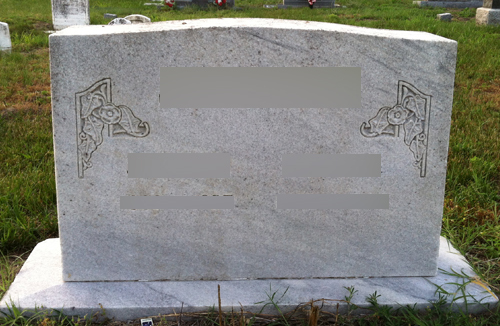 You may not really see the full extent of any damage until or unless the headstone is really clean. NOTE – D/2 is not damaging the headstone! By using D/2, you are cleaning the organic material off the stone and in so doing, you may reveal damage to the stone you wouldn’t have otherwise seen. D/2 is harmless in every way, and it will not cause any stone to deteriorate. But do document the stone condition, taking close-up photos at many angles (you may need this for insurance purposes). Another great benefit of D/2, you won’t need to keep cleaning your headstones often – once a year is sufficient, and you might be able to clean them every 2 or more years, depending on need. Yes, the D/2 solution will remain on the monument for months and months, cleaning the monument, without need for more human intervention. To those of you who don’t believe headstones could or should ever be cleaned fully, I submit that there are several reasons to do this, although I would never condone this be done to the detriment of the stone. I understand that some 200+ year old stones can only get so clean, but I also submit that there are several users of D/2 in Europe who’ve done wonders with 400+ years old monuments and restored them to looking new. It’s not a hopeless effort to clean, especially if you’re unable to scrub headstones physically. Scrubbing isn’t always the best cleaning method, and some people are unable to put in the physical work for various reasons. Much care, but very little effort can be used with D/2. You can truly use the D/2 “hands-free” method of cleaning, and it certainly won’t harm anything…and the stone will always be cleaner. Everyone wins. I believe it to be healthful to keep a memorial as biologically clean as possible. I personally am highly allergic to mold, dust, mildew, lichens, grass, and other bio-materials, so walking through cemeteries can be a health hazard to me. I don’t want to be “that guy” and complain, but some cemeteries are poorly maintained and it can make someone very sick to go “graving” – documenting, photographing, and general cleanup of graves. I’d hate that a historically-rich hobby would make me physically ill, but it can – and it shouldn’t. It’s 2014, there’s no reason we can’t clean things in order for our families and others to enjoy them along with us. What if the infirmed, young children or elderly wanted to visit gravestones of their relatives/ancestors but couldn’t because of their health frailties? I’d hate to think they couldn’t pay their respects – that grieves my heart! Many 100+ year old stones cannot be read, therefore, cannot be documented. If the stone can be cleaned, therefore documented, you can preserve the historical information with a photo, and, if at some point the stone is beyond repair or use, another marker can be made to duplicate the information. I would think it’s better to try cleaning it once with D/2 using a hands-off method, give it some time to work, then later revisit it to take photos and record whatever info you need when you can actually see the engraving inscriptions. At least, if it’s cleaned even once, you get your historical info and don’t ever need to clean it again unless you want to. FRAGILE HEADSTONES – If a very fragile headstone needs cleaning, it’s best to use the “hands-free” method – wet the stone, spray the D/2 + water solution, then walk away. Fragile stones shouldn’t be scrubbed even with the water only method. You may not even know which type of stone material is which, but here’s the main thing you need to know: if you see the headstone is made of ‘crystals’ which look like sand (small grains that glitter in the sun), it’s too fragile to clean with scrubbing. I’ve seen old granite and marble crystallize, and the only thing I could do is spray D/2 and wait. By the way, if you’ve read this far, I personally thank you – your research will pay off. I’m posting personal photos below to prove that D/2 works, and I want to educate the public about this wonderful product. I don’t work for anyone who makes or distributes the product. I’ve done my research, and so has the US Federal Government, who’ve proven that D/2 works and they currently employ D/2 for cleaning our national treasures. WHERE TO BUY: I personally bought my D/2 solution from Limeworks out of Pennsylvania, but it’s available elsewhere. Of note, if you use Limeworks, another graver who owns the “Save A Grave” website offers you an online discount for Limeworks if you use the SAVEAGRAVE coupon code, so try that! Monument slab cleaning AFTER – June 2014 NOTE – I did some overall light scrubbing one month after application by my choice, due to the fact that this is a slab monument that’s parallel to the ground and accumulates more encrusted bio-matter. The D/2 worked ‘much faster’ after I did that. 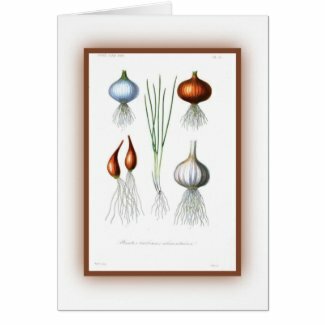 My favorite – the allium family that represents garlic, onions, scallions…more like alli-YUM!